Jewish Home leader says there’s no room for Palestine in ‘God-given’ Israel! This is the sort of rhetoric continues to widen the gulf between Israel and the rest of the world. At least the Israeli Prime Minister tries to pay lip service to the aspirations of the Palestinian people, even if his ‘peace process’ is a mirage. As Israel becomes increasingly isolated and the surrounding Arab nations continue to appoint governments that are actually listening to their own people, the problem for Israel and its remaining ally – the United States – becomes increasingly serious. At some point Israel will be recognised as a serious liability to the US. It is only a matter of time. The process of forming a new government is still slowly moving along, but Jewish Home leader Naftali Bennett, whose far-right party is seen as almost certain to be part of the next government, made his first parliamentary speech last week, rejecting the notion of a free Palestinian state on religious grounds. “There is no room in our small but wonderful God-given tract for another state,” Bennett insisted, adding “it won’t happen” and that negotiations could only begin after the Palestinians accept that not only Israel, but all of their land belongs exclusively to Israel. Bennett maintains that all of the occupied territories, including the entire West Bank and the Gaza Strip, belong to Israel as a sort of divine set-aside, and has faulted Prime Minister Benjamin Netanyahu for being “ambiguous” about whether or not peace could ever be allowed. 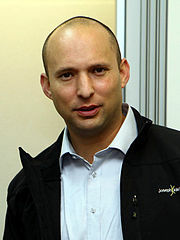 Bennett’s position as an opponent of peace talks on general principle is odd, as Jewish Home has come to a sort of joint arrangement with Yesh Atid, a secular centrist party that has pushed peace talks in the past, to join the government together to strengthen their bargaining position. Tags: israel and palestine, israel and palestine conflict, occupied territories. Filed under Israel and Palestine, israel and palestine conflict by Father Dave on Feb 21st, 2013.